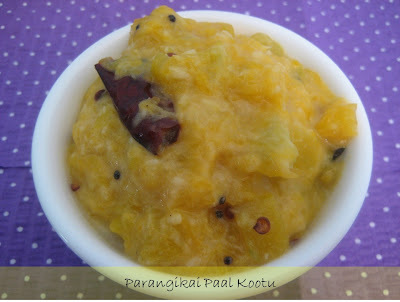 Never made kootu with parangikai .. should try someetime. Looks good. BTW, do you live in downtown? Kootu looks tempting and colourful.healthy too. Interesting kootu recipe...Enjoying your series. Looks simply delicious and yummy !! Been ages i prepared this paal kootu, delicious and inviting.. I love this one but we do it with the young green pumpkins which is not available in US. But now I am back home and gonna go hunting to get the green pumpkin in the grocery store. Adding milk and jaggery is such a cool idea, both of them enhance the sweetness of the pumpkin.. Looks delicious. Nevr tasted kootu made from parangikai...Interesting..Will try it out soon!!! Kootu looks tempting,will surely give this a try. That's a quick dish.Never tried it. this is a very new recipe to me...looks so good,mushy pumpkin looks more tempting too n sure i give this a try..
Yum, very new and delicious looking curry. New recipe to me..Hope you enjoyed.looking good. Love paalkootu recipes.. super good parangikai addition.. This is something new for me. Does it have an acquired taste? Should go well with roti!